As mentioned this morning Chateau Margaux 2016 released for £5,180 along with the second wine Pavillion Rouge which has released for £1,380 per case of 12. We have managed to secure a slightly larger parcel this year and can offer out a very small quantity of both this afternoon. 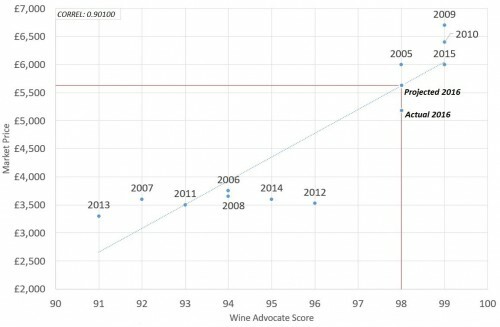 In 2016, Chateau Margaux has been awarded 97-99 points from the Wine Advocate, making it one of the finest ever in its long history of glorious vintages. Martin says ‘The aftertaste is so long you could probably write a letter to your friend enthusing about this wine before the aftertaste fades. Doubtless it is destined to be compared to the magnificent 2015 Château Margaux and to be truthful, there’s a hair’s breadth between them. In a word: crystalline.’ In this sense, we can expect the 2016 to be awarded the upper limit of its barrel score, which would place it on par with 99 point scoring 2010 and 2009 vintages which trade at £6,400 and £6,700 respectively. Today’s release price represents a 9% euro increase, which is wholly justifiable considering the 2015 has risen 41% since release last year and trades at £6,000. Therefore, the 2016 price is a 14% discount to the 2015 and 23% below the 2009. The analysis below of Margaux demonstrates the discount to projected price buying on release can offer. Although today’s release price of £5,180 does separate the 2016 vintage from the lower scoring vintages clustered between £3,500 and £4,000 per case, it does highlight the value when compared to the similarly scored 2005, 2009, 2010 and 2015 vintages. The graph also shows a discount of around £470 between today’s release price and the projected price of £5,650. 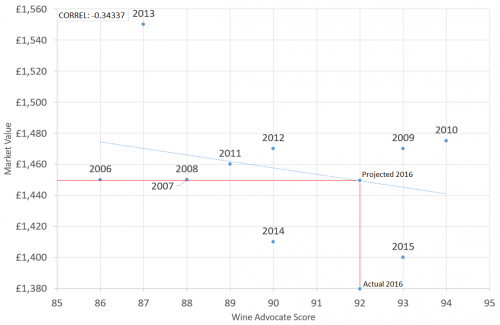 If Margaux 2016 later realises the upper end of its banded score, this estimate will undoubtedly seem conservative and a sharp rise in price will surely be seen. These observations are underpinned by an exceptionally strong positive correlation or 0.90100. This is a truly great Margaux and one to own, yet it has already sold out on the Place du Bordeaux and our offering today will disappear very quickly. The second wine of Margaux, Pavillion Rouge 2016 has also released, priced today at £1,380, a 12% increase on the 2015 release price. Pavillon Rouge is an example of a wine where consistently strong demand results in an unresponsive reaction to scores. The demand for Pavillon Rouge across Asia remains unfaltering and the weak negative correlation between past scores and market price demonstrates this. However, it is noteworthy that a £70 discount can be seen between today’s release price and the projected value. Past performance shows Pavillon Rouge consistently rises after release – this coupled with today’s discount indicates positive returns in the near term should be felt. Pavillion Rouge 2016 is, like the Grand Vin, one of the finest ever with 91-93 points from Neal Martin and 94-95 from James Suckling. Pavillion Rouge is a great way to access the stunning quality produced throughout this Estate and is a proven investment wine which provides superb returns. Château Margaux is located in the commune of Margaux and unlike many other properties in the Médoc has had very little modernisation. The beautifully elegant structure of the Château features on the label and in terms of architecture it has no equal amongst its peers. The wine is often described as feminine with a steely structure, satin texture and perfectly balanced. It was ranked number two behind Lafite in the 1855 classification which has given rise to the saying: if Lafite is the king of clarets Margaux is surely the queen. Château Margaux has had a long history of making rarely surpassed wine, the 1654 collaboration with the Pontacs family (through marriage) of Haut Brion led directly to the inclusion of Margaux into the group of the four Four Growths, where it has remained since. The complex elegance and femininity of Margaux has led to a worldwide demand and a price tag that has tripled over the past decade. The 2016 Pavillon Rouge du Chateau Margaux contains the highest proportion of Cabernet Sauvignon ever at 84%, with 13% Merlot and 3% Petit Verdot, representing 26% of the total harvest. Matured in 50-60% new oak, it has a very pure redcurrant and cranberry scented bouquet with a touch of graphite. The palate is medium-bodied with quite firm tannin on the entry, thanks to the high percentage of Cabernet, and it is saline in the mouth with a pinch of white pepper towards the finish. It will need three or four years in bottle. Very concentrated and tannic Pavillon Rouge. Muscular. Full body and lots of intense fruit. Four-square.